In AP Research, you will be assessed on your academic paper and your presentation and oral defense. These two components will be used to calculate a final AP score (using the 1–5 scale) for AP Research. You must submit all performance tasks and your presentation and oral defense must be scored by your teacher no later than May 2, 2019 at 11:59 p.m. ET. See your AP Research teacher for specific deadlines. 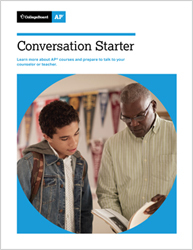 Note: AP Research is only available to students whose school is participating in the AP Capstone program and who have successfully completed AP Seminar. The following resources contain the remaining available Free Response Questions and Scoring Guidelines for the AP Research Exam. To access the files below, you need to log into your College Board account. If you do not have a College Board account, you can create one by selecting ‘Sign In’ in the header and following the prompts to Sign-Up. Interested in Taking AP Research? Does our school offer AP Research?